Much like the Apostle Paul, Violet Jessop survived a trio of maritime disasters, including the sinking of RMS Titanic. Jessop began work as a stewardess for White Star Line in early 1911. White Star is best remembered in history as the owner and operator of the Titanic, but in the late 19th and early 20th century the company ferried thousands of immigrants from Europe to the United States. 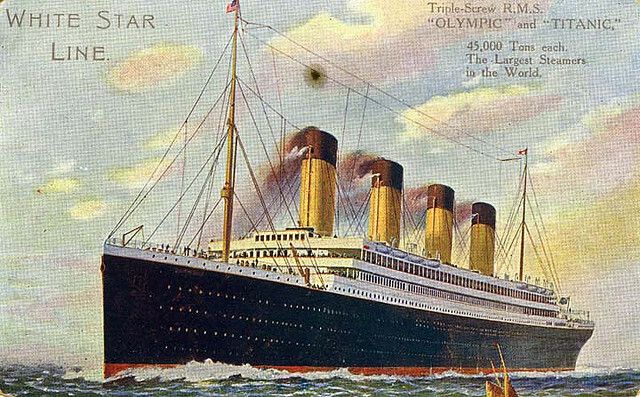 Jessop first assignment was aboard Titanic’s sister ship RMS Olympic. While cruising off the Firth of Forth on September 20, 1911, the Olympic and the Royal Navy armored cruiser HMS Hawke collided resulting in significant damage to both ships. Neither Jessop nor any of the other passengers and crew aboard either ship were injured even though two of Olympic’s watertight compartments were flooded and the Hawke nearly capsized. Jessop’s next brush with death occurred merely 7 months later on April 14, 1912 when Titanic sank after its infamous collision with an iceberg. For four years Jessop enjoyed smooth sailing aboard her employer’s ships until November 1916. RMS Brittanic, which had been converted to a hospital ship, struck a mine on November 12, 1916 and once again Jessop found herself scrambling for the lifeboats. Despite her three near-death experiences, Jessop continued to work aboard passenger liners and retired to England where she passed away in 1971. What an interesting person. She cheated death three times! Thanks to this article, I looked her name up. She had a very good story the world should know.